A diffusionless transformation (shown in Figure 2877) represents a phase change (change in crystal structure) that occurs without the long-range diffusion of atoms but rather by some form of cooperative, homogeneous movement of many atoms. These movements are small (usually less than the interatomic distances) and the atoms in the original and formed phases maintain their relative relationships. 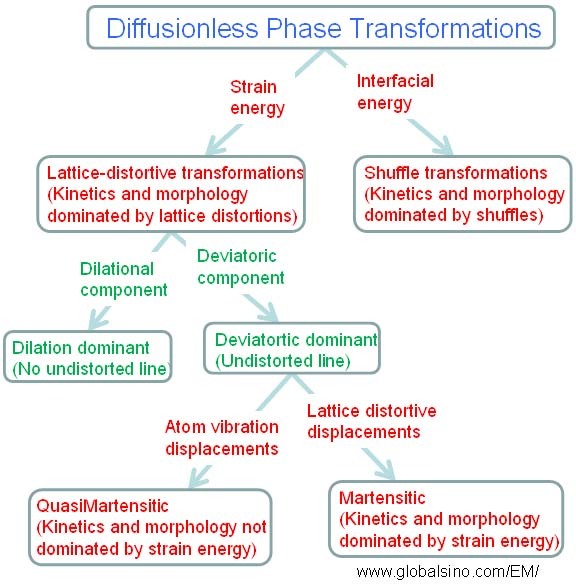 The most commonly encountered diffusionless transformation is the martensitic transformation which, however, is only one subset of non-diffusional transformations. The martensitic transformation in steel represents the most economical example of this type of phase transformations but an increasing number of alternatives, such as shape memory alloys, are becoming important as well. The generic term, martensite, refers to a class of microstructures formed by diffusionless phase transformation in which the original and formed phases have a specific crystallographic relationship. Figure 2877. Diffusionless Phase Transformation. The book author (Yougui Liao) welcomes your comments, suggestions, and corrections, please click here for submission. You can click How to Cite This Book to cite this book. If you let book author know once you have cited this book, the brief information of your publication will appear on the “Times Cited” page.